The color of the crater lake changes between green and chartreuse. At 3432 meters the Irazu Volcano is the highest volcano in Costa Rica. The view from the top is excellent in good weather conditions. It's possible to see the Caribbean coast and the Pacific ocean from up here. Below in the West is San Jose and sometimes the Barva Volcano is not hidden in the clouds. The name of the volcano comes from an indigenous origin. It derives from the combination of "ara" meaning point and "zu" meaning thunder. 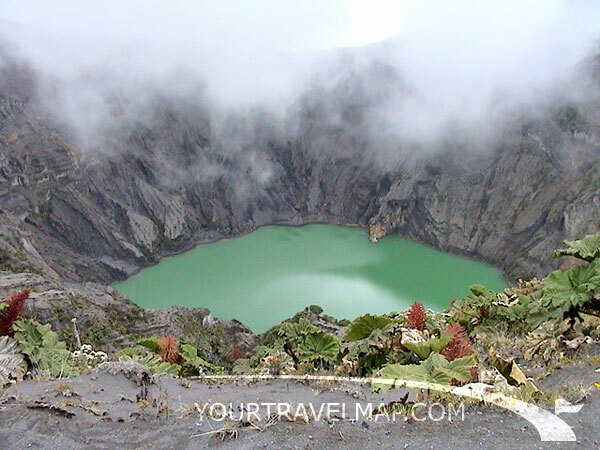 On the bottom of the crater is a 1 kilometer wide turquoise colored acid crater lake. Sometimes the crater dries out and there is no water at all. In the past it was possible to walk around the crater, but nowerdays this is no longer allowed because of security reasons. 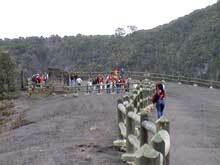 Visitors on the Irazu Volcano. 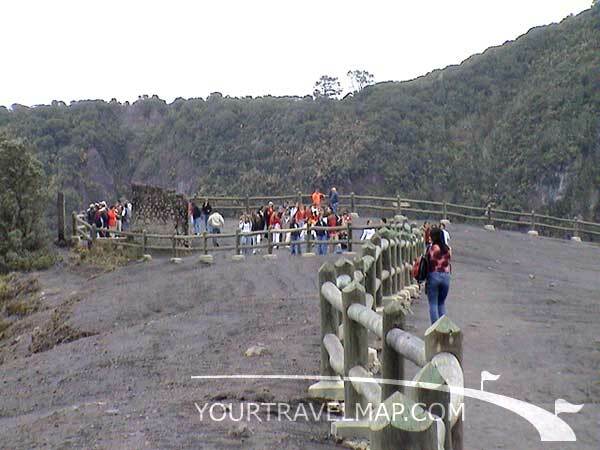 The volcano is the center of the national park that measures 2300 hectares, founded in 1955. A large part of the park area is covered by a rain- and cloud forest. Often one has to drive through the clouds before reaching the top. The average annual temperature on top of the volcano is only 12°Celsius. The last big eruptions took place between the years 1963 and 1965. Volcano Irazu erupted, after 20 years of inactivity, during President John F. Kennedy's visit March 13 in 1963. It spew ash for 2 years, damaging crops and sending ash as far as San Jose. The Irazu volcano is with an altitude of 3432 meters the highest volcano in Costa Rica. The crater is 1 kilometer wide. With good weather conditions it is possible to sea the Caribbean sea and the Pacific ocean from the top. The last big eruptions tool place in 1965.
Business hours: The park is open every day from 8:30 am to 3:30 pm. 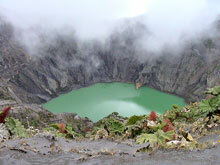 Irazu Volcano National Park telephone: (506) 2551 9398. The lava and ash deposited during the eruptions provide valuable nutrients for the soil, which is good for agriculture in the area.